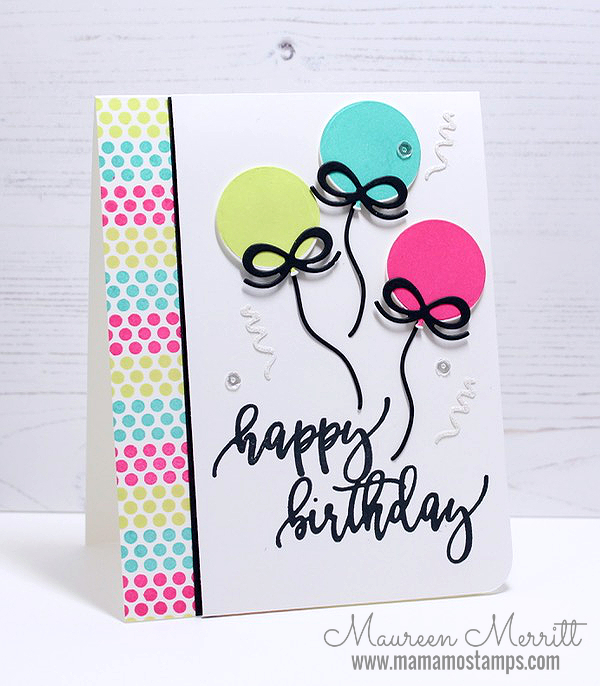 I'm thrilled to be joining CASology for their 5th Anniversary Blog Hop! 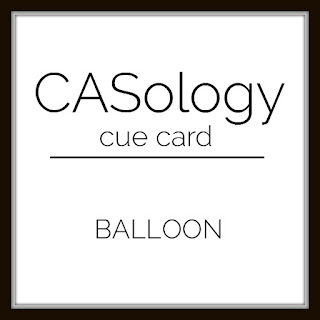 CASology was integral in my development as a CAS stamper and one of the first teams that I ever designed on. I have fond memories of CASology and the friendships I made on that team! I'm thrilled for Melissa and this milestone moment! I'm also thrilled that Melissa asked me to join in the anniversary hop!! You should have arrived here from Sherrie Mannion. If not, head on over to CASology to start from the beginning. How's this for a fun & celebratory CAS card? I chose a happy color combo of Party Dress, Melon Ice and Aquatini. I love the saturated colors and crisp images I get from the Catherine Pooler inks! 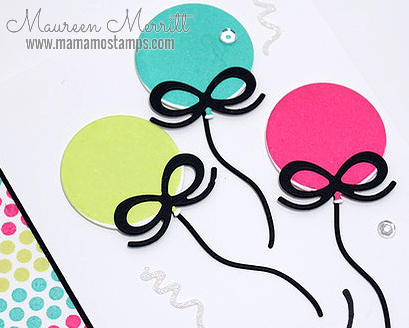 I stamped the balloons and the card base with these colors, then added some black accents to make the design pop! CAS perfection! Time for you to start hopping along. Your next stop is Uniko Studio. There are lots of fun prizes including gift certificates including Avery Elle, Concord & 9th, The Ton, Wallflower & MORE. 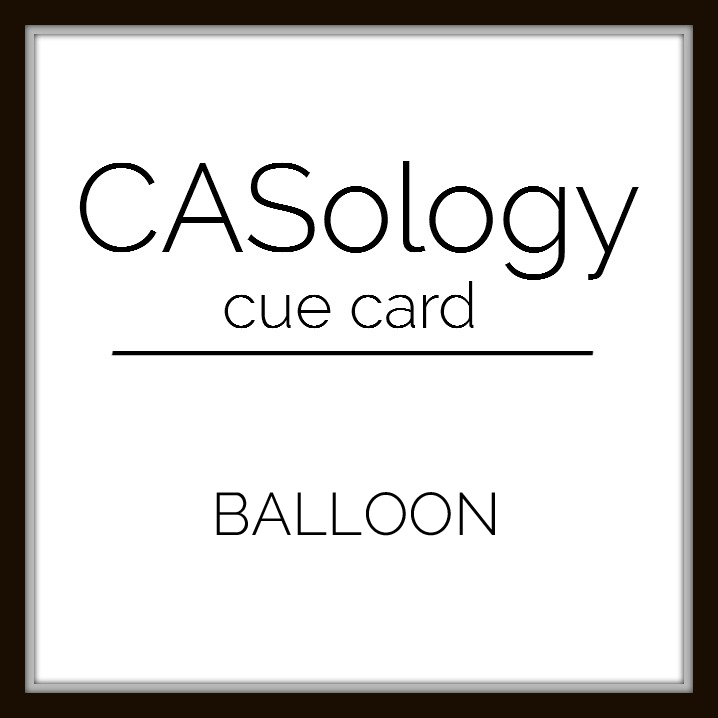 Head to CASology for the full list of prizes. Good luck and happy hopping!!!! Concord & 9th Triangle Turnabout for Boys & Girls! We are in the middle of the Concord & 9th Masterclass over at StampNation! Concord & 9th is teaching a class on Unexpected Layering. One of the topics they covered includes their Turnabout stamp sets. If you haven't seen these yet, you are in for a real treat! 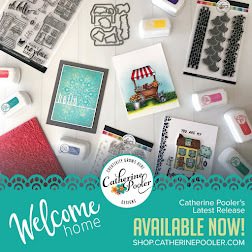 It's been long time since I have gotten this excited over a stamp, it combines so many things I love about stamping all in one...building custom backgrounds, versatility and it's different, different from anything else out there! I love a good clean & graphic background. Although I know that you can rotate this stamp less than the four rotations, I just love it best like this so I replicated this design twice; once for boys and once for girls! 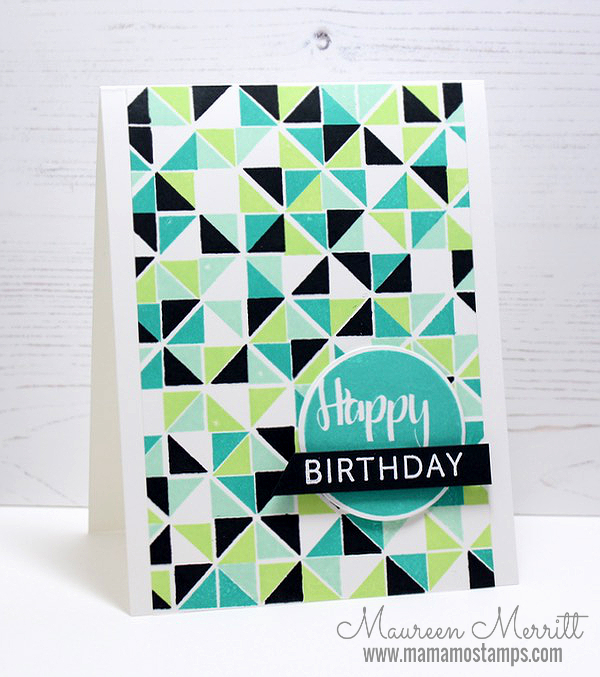 I paired Triangle Turnabout with the Spot On stamp set from Catherine Pooler Designs and they are a match made in heaven. With a bold background like this, I wanted a simple sentiment...Spot On was the perfect addition. 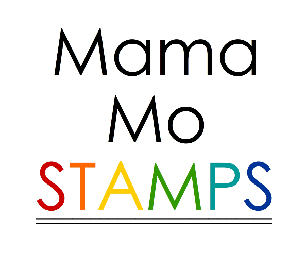 I highly encourage you to join us over at StampNation. The Concord & 9th Masterclass is really blowing me away. 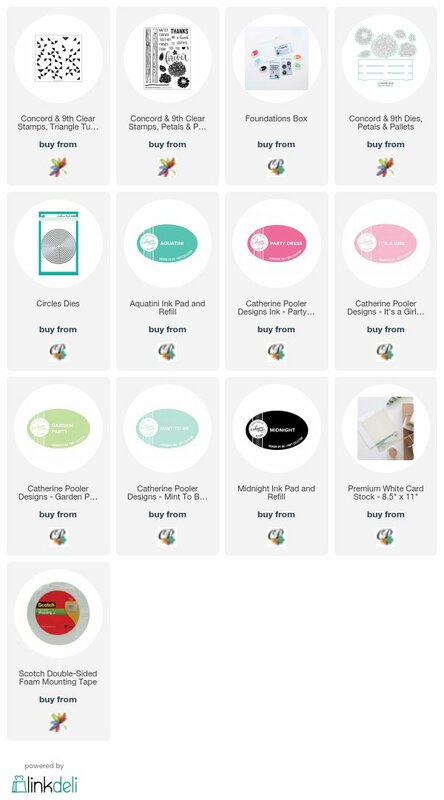 Not only do they have amazing products, Amy's teaching style is clear, concise and so easy to follow. Her cards are amazing as well! Hello there! Thanks for stopping in today. I made this card quite a while ago and forgot to post it? Anyway, the best part about making this card is that it was all for fun... no challenge, no deadline, I just had some new stamps and wanted to get them inky. 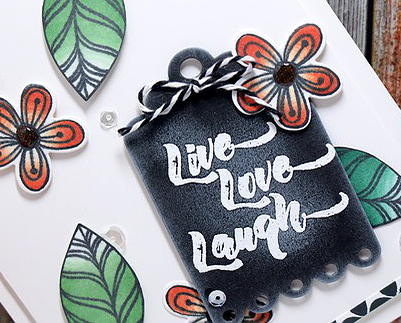 The Bold Blooms stamp set by Pretty Pink Posh is simply adorable! 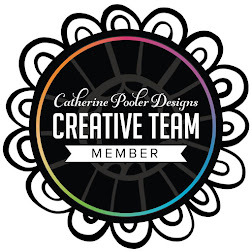 I love that Paulina included solid stamps for us non-colorers (would someone please tell me if this is a word or what I should be using in its place, please ;) My goal for this project was just to stamp and die cut a bunch of these blooms and then create with them. 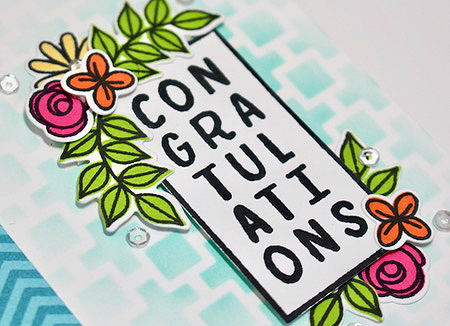 Bold Blooms looks great accenting this Congratulations sentiment from Simply Stated by Catherine Pooler Designs. Funny, when this stamp set was being designed I fought tooth and nail to have this particular stamp removed from the set. 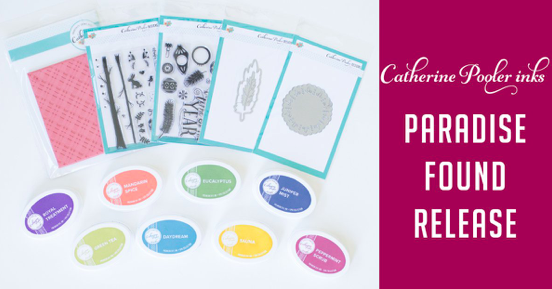 Catherine envisioned stampers using it in fun and unique ways, I didn't see it. Fast forward a few months and I'm a huge fan, I love it and made sure to tell Catherine just that! This card came together quite easily. I added some background sponging with the Mod Squared Stencil to ground my focal point and a strip of patterned paper for more color and interest. I hope you've enjoyed my card today. Have a good one! 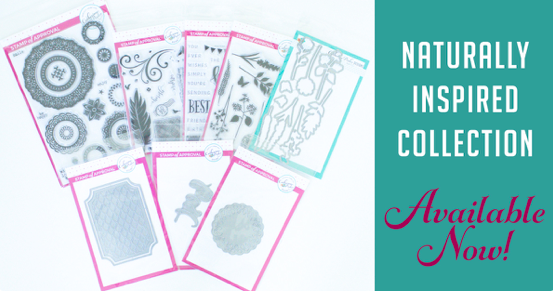 Head on over to the CAS-ual Fridays Stamps blog to see my full project and to see what Nora cooked up with these pens. There are also some prizes and giveaways, so make sure you leave comments on the CAS-ual Fridays blog and then hop over to Chameleon! 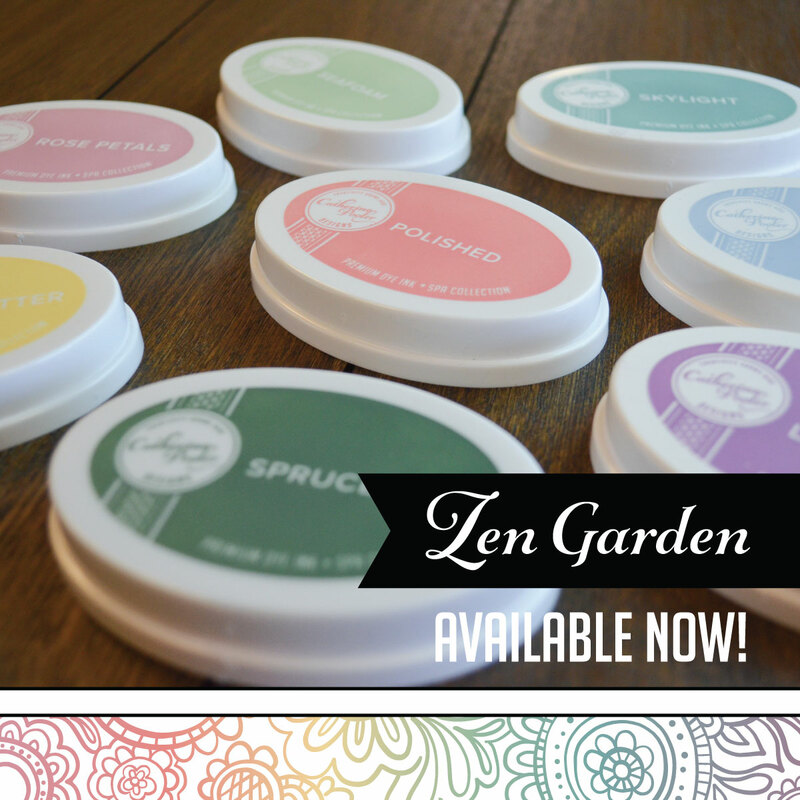 CP Designs Freshly Picked New Release! 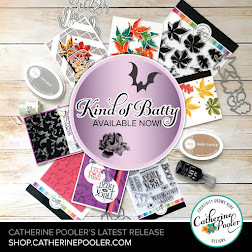 New products have arrived at Catherine Pooler Designs...new stamps, dies, stencils and ink. WOOT! 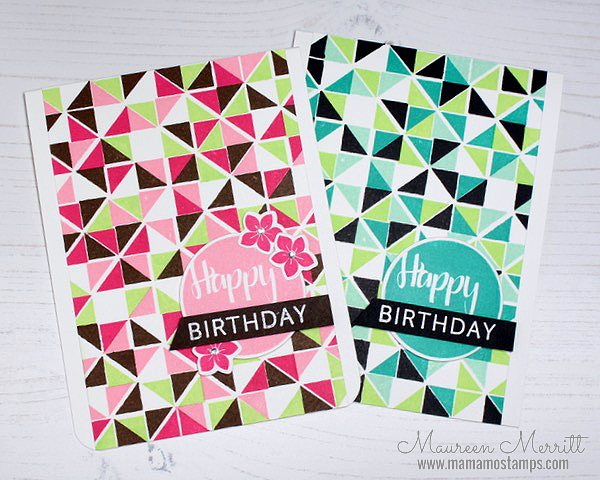 Today I'm sharing two cards using the newly released product. 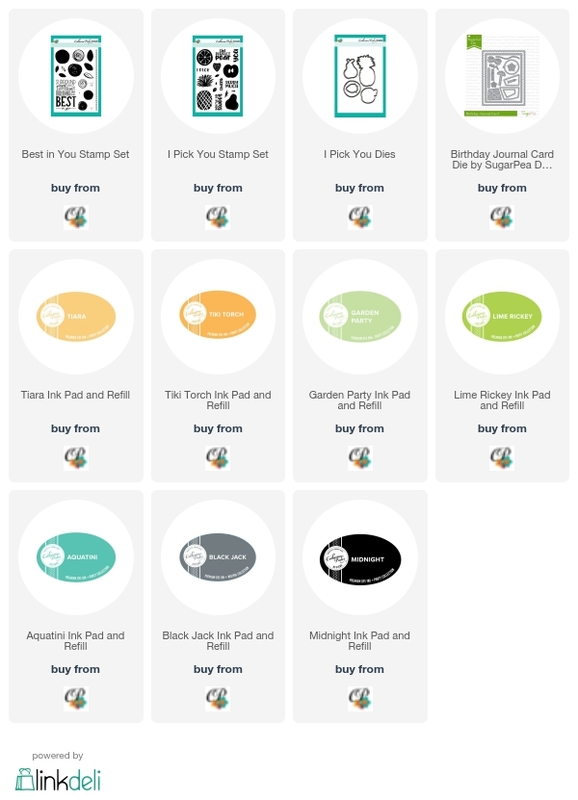 First up, the I Pick You stamps and dies. I Pick You is right on trend. Have you noticed fruit popping up on everything from home decor to clothing? 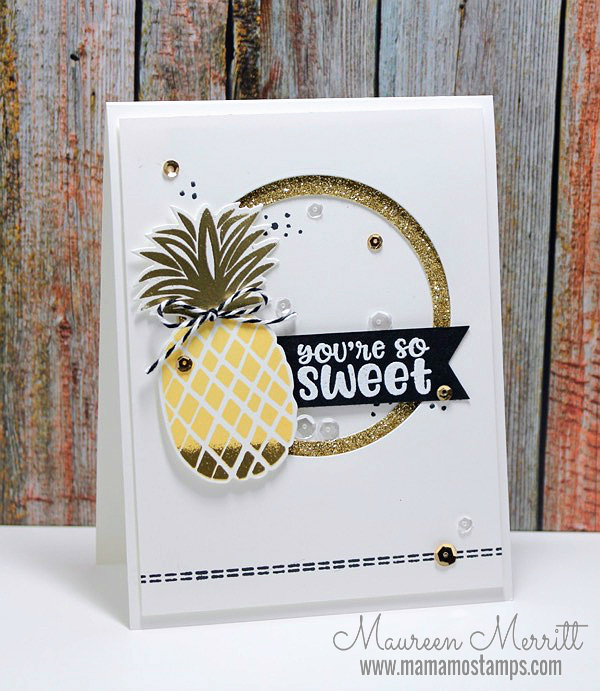 I'm pretty smitten with pineapples right now and who can resist a pineapple dipped in gold?!!! 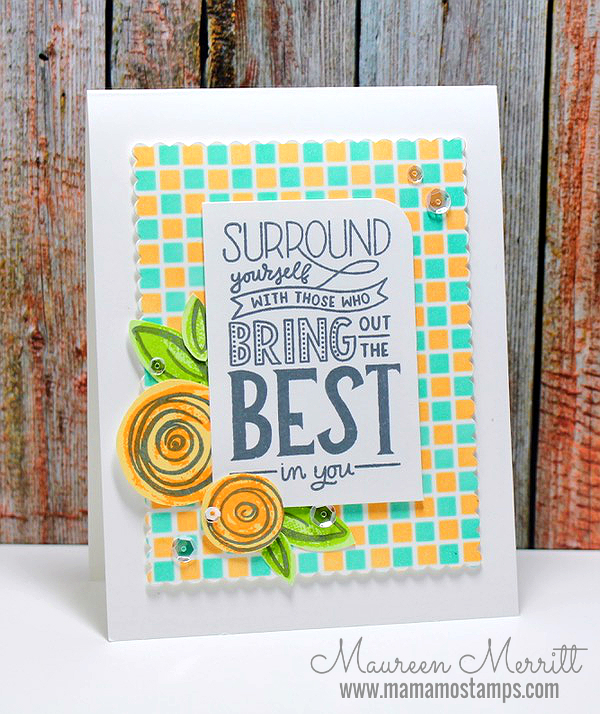 I used the Circle Dies to create a faux shaker and stamped the stitches from the new "Best of You stamp set. 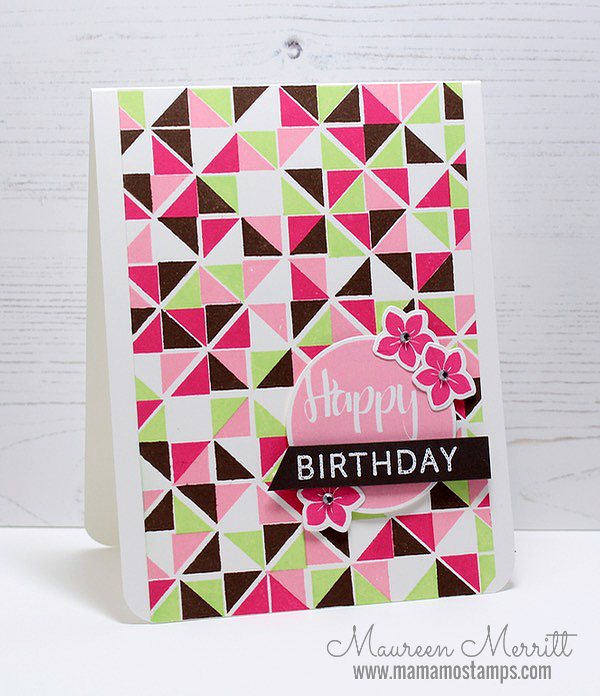 My next card features the Best of You stamp set, as well as the Checkerboard Stencil and new Black Jack ink. This was a fun one to make. I started by double stenciling the Checkerboard Stencil. 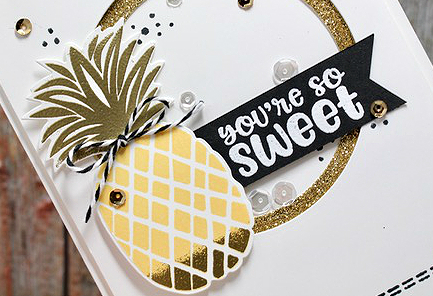 To do this sponge over card stock with one color, then pick up your stencil and then reposition it so you are covering all of the spaces you've already sponged, then sponge again in another color. It sounds way more difficult than it is. Give it a try I promise it's easy! 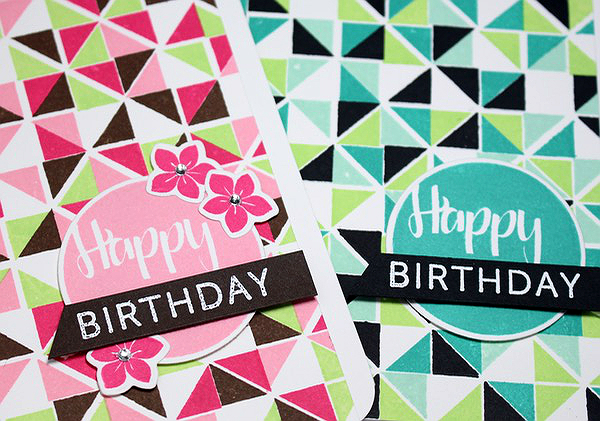 This might be my new favorite color combo...Tiara, Tiki Torch, Garden Party, Lime Rickey, Aquatini and Black Jack, the newest in the CP ink line. Black Jack is a dark gray, an absolutely perfect neutral to add to your collection. The rest of the card came together pretty quickly and easily. 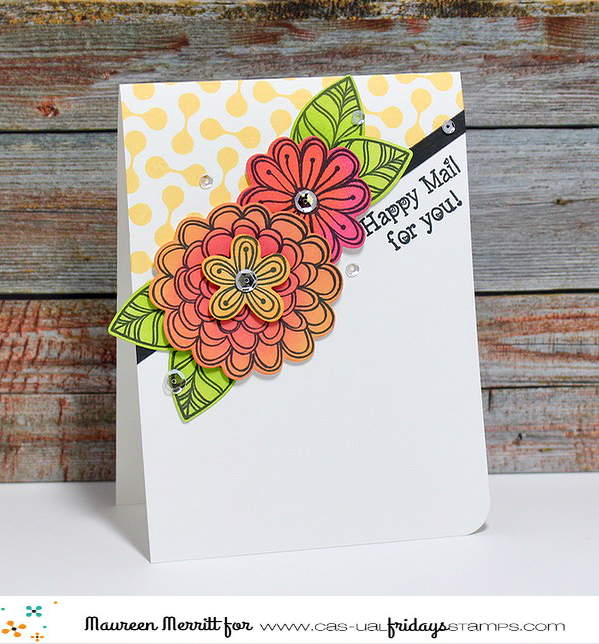 I really wanted the Best of You sentiment to shine so I popped that up on a white panel and added a simple floral cluster from the same stamp set. 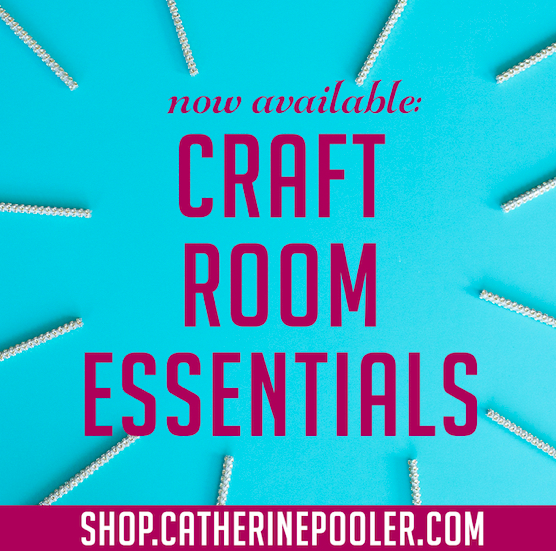 Head on over to Catherine Pooler Designs to see all of the amazing new products!!! Happy shopping! 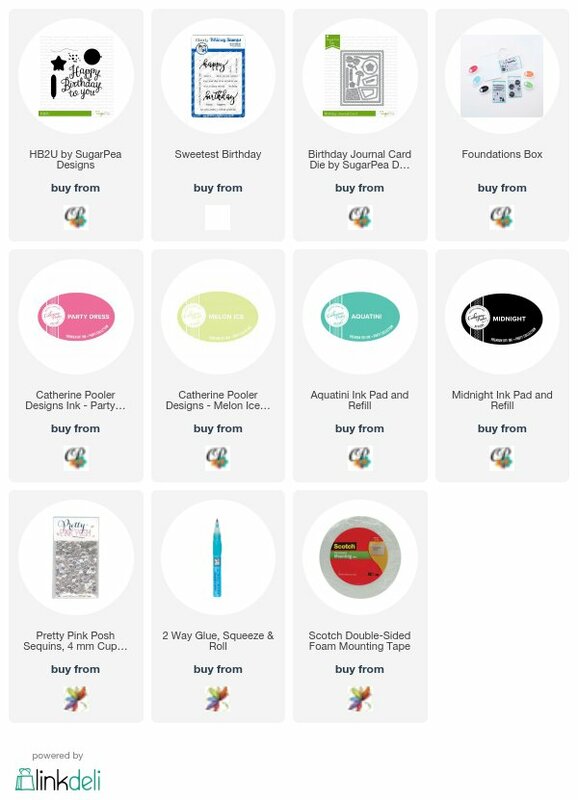 CAS-ual Fridays Stamps - Happy Mail! Who doesn't love to get a little happy mail, especially when it's a bright and sunshiney as this?! I love playing with different ways to color line stamps. 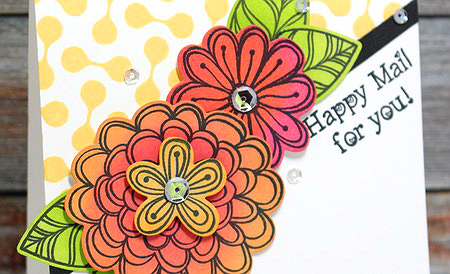 For this card I stamped the floral and leaf images from the Pretty Posies stamp set by CAS-ual Fridays in black ink, then sponged them with ink. 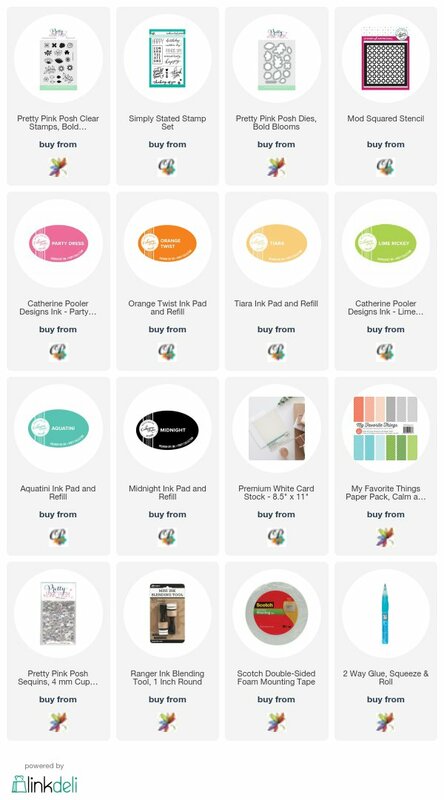 You can use one ink per image or multiple inks to give variation in color. I used a combination here. 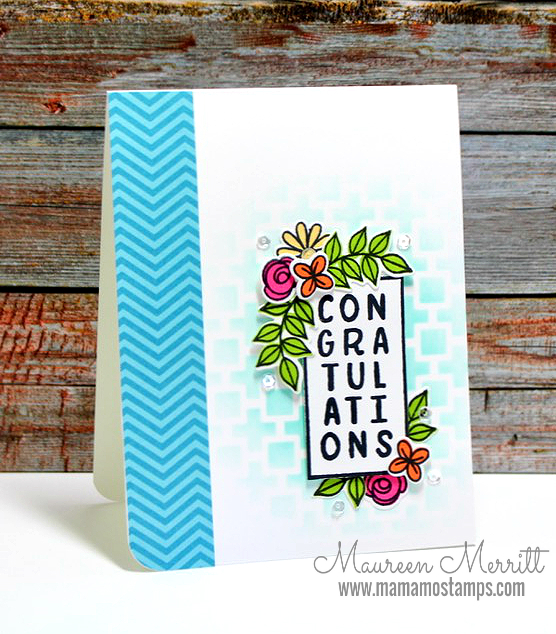 I stamped the Curtis Background stamp on a diagonal on the top of the card, and added the black strip of card stock to add definition and to compliment the black in the stamped images. I struggled to find a sentiment that would fit perfectly into that little spot, this one from Special Delivery was just what I was looking for. Not only does it fit in the space but the sentiment and font flow with the design. 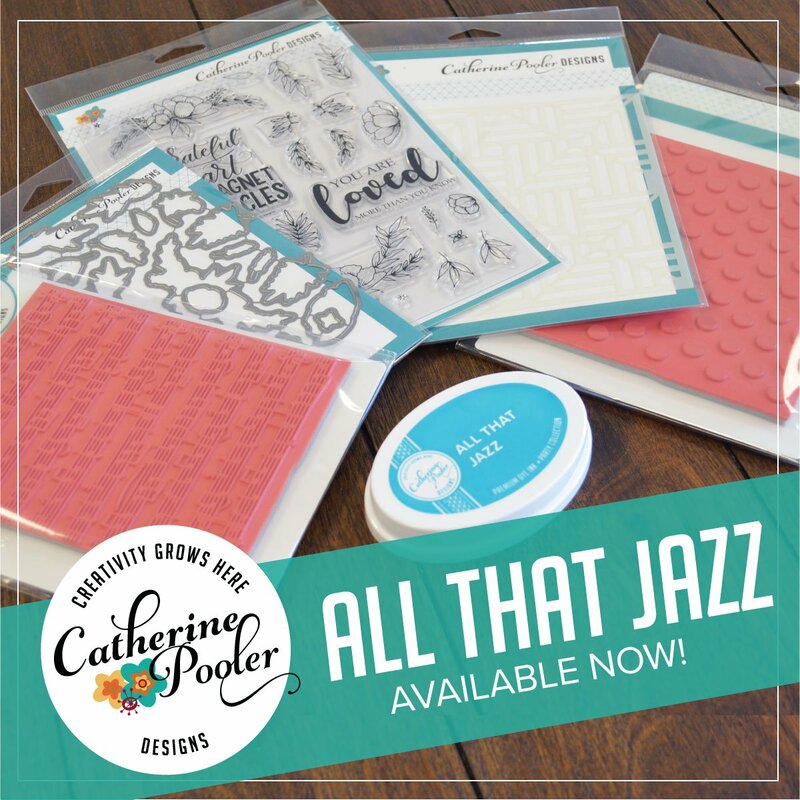 I love when you can use a lot of different stamp sets and still have your design flow like it all just belongs together! A simple scattering of sequins finished off this card perfectly.